As I know, the PCB fab charges with the size of the board, so I was wandering is there a standard guide for minimum distances between components? So that I can cram as much as I can in a limited space. There are IPC standards for component footprints. I recall that there are variations, roughly normal, larger and smaller. 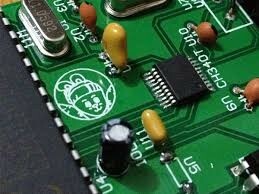 The minimum distance between components is determined by how close you can place them, and you need to be sure that you don't violate your PCB fab's clearance between pads, and you are using typical voltages. You also need to provide room for the tracks between parts. Beyond constraints due to voltages or minimum trace widths, on a larger scale the mechanical size should be convenient and conform to standards or convention if applicable. For components there are 2 rules for the space between components: 1. space equal to height 2. leave space for the PCB traces.